It's summertime in Paris. A time to sit outside, soak up the sunshine and revel in the warm weather. Over the next couple of weeks, I'll be sharing some of my favorite terraces in the city with you. Since I'll need photos for the posts, it will give me an excellent reason to re-visit some of my preferred spots and discover new ones! First up is the magnificent Raphael La Terrasse. 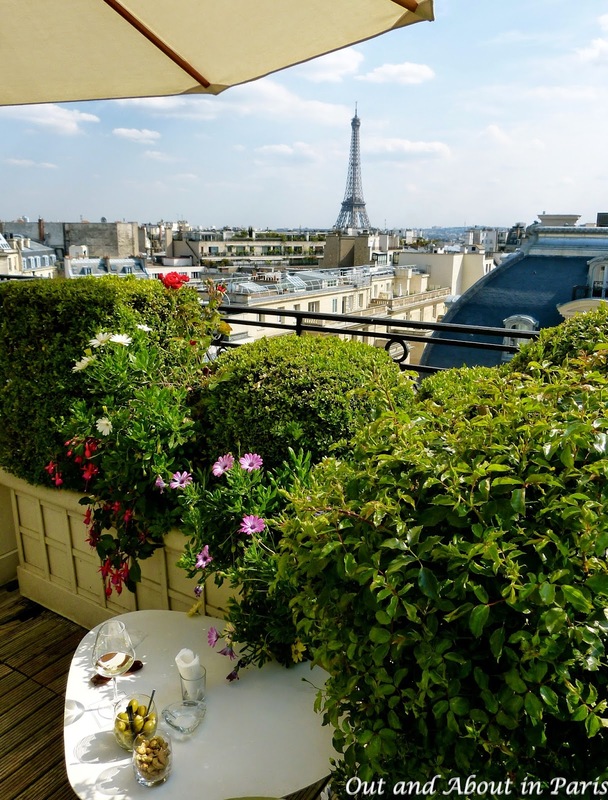 Located on the seventh floor of the Hotel Raphael, the rooftop terrace offers some of the most stunning panoramic views of the city: the Eiffel Tower on one side and the Arc de Triomphe on the other! The hidden nooks and crannies created by precisely trimmed boxwood and fruit trees make it the perfect place to linger over a romantic meal or relax with friends. A bottle of Perrier-Jouët champagne was chilling on ice and the scent of roses wafted through the air when I made an impromptu visit to the terrace around 4:30 last Thursday afternoon. With the lunchtime crowd back at work and the hotel's guests out exploring the city, only a few of the tables were full. It was quite a contrast from the times when Stéphane and I have passed by La Terrasse on the weekend and tried (always unsuccessfully!) to get a table. To reach the terrace, pass through the lobby, with its rich wood paneling and oil paintings by old masters, to the rear of the hotel. On the left hand side, you'll spot a charmingly old-fashioned elevator. Take it to the 7th floor terrace. 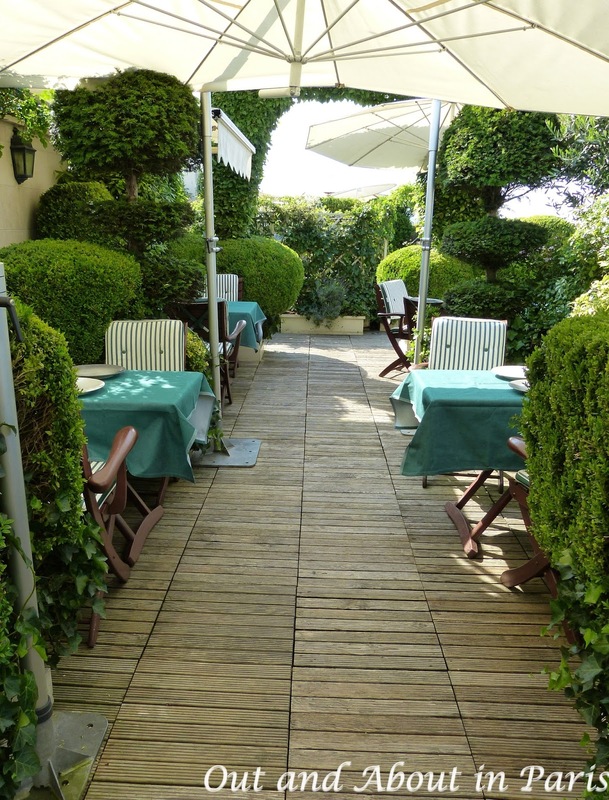 When the doors open, enter the verdant oasis with its breathtaking 360-degree view of Paris. Enjoy! With special thanks to Élodie Berta of the Paris Convention and Visitors Bureau for telling me about Raphael La Terrasse. Click here if you would like to read about some of Élodie's other tips for visiting Paris. Love your blog. Thanks for sharing all your tips and experiences... and photos!